Today’s world can’t be fully understood without first having achieved a deep knowledge of World War II and the largest camp created by Nazi Germany in all of Europe: Auschwitz. Just as knowing is understanding, understanding helps prevention. Because of that, the Auschwitz exhibition and the Community of Madrid give the lower and upper secondary education students the chance to visit the exhibition for free. 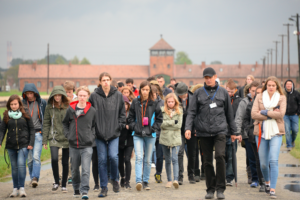 This initiative is meant to create an individual and collective memory of Auschwitz, and to foster reflection among students on the origins of violence, as well as the importance of defending human rights, promoting understanding among peoples and cultures, and respect for global diversity. All schools willing to visit the exhibition can now make their reservation for free, Tuesday to Friday from 10 to 13 hours, following the instructions detailed in this link. The exhibition will be released in Centro de Exposiciones Arte Canal, Madrid, on December 1st 2017, and will stay there until the 17 of June 2018. My name is Costas Papadopoulos and i am the director of Milos senior high school,Greece. Our students wiil visit Madrid between 24 and 27 Febr. 2018 and we are interesting on the free entrance in the Auschwitz exhibition, on Tuesday, February 27th, 2018, 10 a.m. The students are totally 15, in the age of 17, and they will be companied by three teachers. Please answer if it is possible to confirm this date. Thanks. Hi, Costas. Thanks for your message. If you want to make a reservation for schools, we will thank you if you write to the following email: auschwitz@clorian.com. Best.